History of changes to the site, listed in reverse chronological order, since Jan 2004. Scroll or jump down to access updates prior to the current year. Note: New additions to the acknowledgments list are not explicitly noted, but as a rule the names of contributors not already listed are added at the same time as their contributions. 21 Apr 2019 Put up a poster image for the 17 May 2019 Porcupine show at the 331 Club in Minneapolis (Art-A-Whirl) and updated the 2019 poster index page. 19 Apr 2019 Replaced 92 dead dates page links to Bob Mould setlists from 1996-2000. These had been hosted on Mark Weygandt's old Roadrunner website, which faded away many years ago. Fortunately, almost all of the files were recoverable via the Wayback Machine. The pages were originally in plain text, but have been converted to html and rehosted here. Mark's setlist pages also included comments and informal show reviews posted by members of the Sugar internet mailing list; these contributions have also been preserved, except that email addresses have been redacted in the unlikely event that any might still be active. In a couple of cases there was no precise setlist available, only comments, but these have been included anyway. Thanks to Mark Weygandt for compiling all this info back in the day, and to all the intrepid Sugarlisters who posted their thoughts on the shows. 18 Apr 2019 Added a skimpy venue description page for the defunct Mill City Music Festival in Minneapolis, replacing the dead dates page link to its long-gone website. Also removed the dead link to an associated venue image (what was actually depicted there is anybody's guess at this point). Added an image of the 1999 festival schedule listing Bob Mould's 05 Sep 1999 performance at the festival and updated the 1999 poster index page. 16 Apr 2019 New Porcupine date announced: 17 May 2019, 331 Club outdoor stage, Minneapolis (Art-A-Whirl). 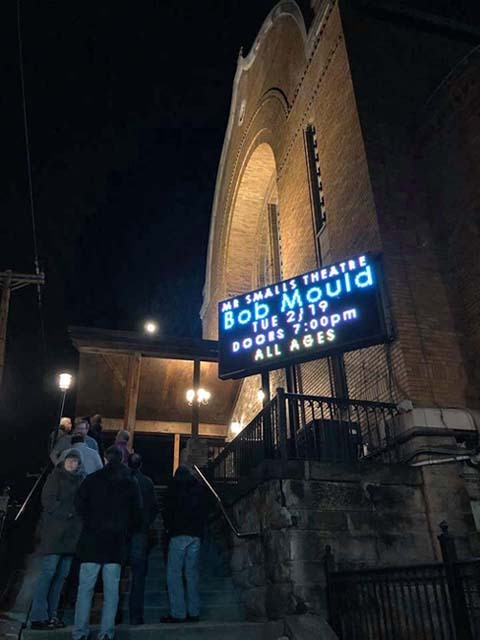 16 Apr 2019 Put up a poster image for the 30 Mar 2019 Bob Mould Band/Porcupine show at the Palace Theatre in St Paul and updated the 2019 poster index page. 15 Apr 2019 Fixed a dead dates page link to the Palace in Los Angeles (no longer operating). Deleted the associated venue image link, also dead, but will put together a page for it later, as there are photos available. 15 Apr 2019 Put up a performance stills page for the 07 Jun 1982 Hüsker Dü show at Smilin' Buddha Cabaret in Vancouver BC. Thanks to Greg Norton. 14 Apr 2019 Fixed a dead dates page link to the Riviera Theatre in Chicago. Thanks to Nancy Juestrich Davidheiser (NY) and Geoff Pryce (Southampton). Thanks to Opu Anwar, Tim Difford, Anthony Djuren, Brad Hinton, James Lindbloom, Les Ridingin, Alicia J.Rose, and Terry Thompson. Thanks to Jay Gorham, Jason Narducy, Alicia J. Rose, and Deerdra Wing. Thanks to John Collins (Orpheum) and Jason Wittenberg (Electric Fetus). Added the postponed Orpheum date (previously unlisted) to the dates page and updated the dead Orpheum link. 06 Apr 2019 Put up a candid images page for the 20 Mar 1987 Hüsker Dü meet-and-greet at the Harvard Square branch of Newbury Comics in Cambridge, and updated the candids index page. Thanks to John Collins. 03 Apr 2019 Put up a setlist page for the 02 Apr 2019 Bob Mould Band show at Granada Theater, Dallas TX. Thanks to Brad Hinton and Jason Narducy. 03 Apr 2019 Put up a performance stills page for the 03 Oct 1984 Hüsker Dü show at Ritz in NYC. Thanks to "Champagne" Bob Portella. 03 Apr 2019 Put up an image of Grant Hart's handmade flyer for the first-ever Hüsker Dü shows, 30-31 Mar 1979 at Ron's Randolph Inn in St Paul MN, and updated the 1979 poster index page. Thanks to Greg Norton. 03 Apr 2019 Put up a flyer image for the 22 Jul 1984 Hüsker Dü instore performance at Northern Lights Records in St Paul. Also corrected the dates page to indicate that this gig took place at the branch store located in the Hillcrest Shopping Center in St Paul, and not the one on Hennepin in Minneapolis as had been previously listed. Updated the venue descripton page for Northern Lights to reflect the corrections, and updated the 1984 poster index page. Thanks to Jason Wittenberg and Tim Kelly. Thanks to Greg Norton for the Porcupine setlist. 25 Mar 2019 Fixed a dead dates page link to the Ogden Theatre in Denver. 19 Mar 2019 Put up a setlist page for the 17 Mar 2019 Bob Mould Band show at Academy 2, Manchester UK. Thanks to Opu Anwar, Matt Lister, and Kieron Perry. Thanks to Opu Anwar, Steve Avery, Richard McIntosh, Joe Novotny, and Graeme Sutherland. 17 Mar 2019 Put up a setlist page for last night's Bob Mould Band show at Liquid Room in Edinburgh. Thanks to Joseph DeLappe and Jason Narducy. 16 Mar 2019 Put up a setlist page for last night's Bob Mould Band show at Brudenell Social Club in Leeds. Thanks to Jason Narducy. Also put up a poster image for the Rolling Stone Park Festival and updated the 2019 poster index page. 15 Mar 2019 Put up a club calendar image for the 14 Mar 2019 Porcupine show at City Winery in Boston and updated the 2019 poster index page. Thanks to Zvia Admon, Paul Boddy, Graham Judd, and Graeme Sutherland. Thanks to Jason Narducy (London) and Greg Norton (Boston). Thanks to Greg Phillips (Carrboro) and Stefan Saffer (Berlin). 13 Mar 2019 New Porcupine date announced: 28 Jun 2019, Reggies, Chicago, opening for Flipper. More info here. 13 Mar 2019 Put up a setlist page for the 12 Mar 2019 Bob Mould Band show at Het Depot in Leuven, Belgium. Thanks to Jason Narducy. 12 Mar 2019 Put up a setlist page for the 11 Mar 2019 Bob Mould Band show at zakk in Düsseldorf. Thanks to Markus Fels, Jason Narducy and Markus Schafitel. 11 Mar 2019 Put up a poster image for the 13 Mar 2019 Porcupine show at The Low Beat in Albany NY and updated the 2019 poster index page. Thanks to Hans Christopher. 11 Mar 2019 Put up a performance stills page for the 11 Mar 2019 Bob Mould Band show at zakk in Düsseldorf, Germany. Thanks to Markus Schafitel. 11 Mar 2019 Put up an alternate poster image for tonight's Porcupine show at The Pyramid Scheme in Grand Rapids MI and updated the 2019 poster index page. 10 Mar 2019 Put up a performance stills page for the 09 Mar 2019 Bob Mould Band show at Columbia Theater in Berlin. Thanks to Jeff Kempa. 09 Mar 2019 Added this collection of Hüsker Dü paintings by Danny O'Connor to the Hüsker Dü art images page. Thanks to Fred Martens. 09 Mar 2019 Put up a setlist page for the 09 Mar 2019 Bob Mould Band show at Columbia Theater in Berlin. Thanks to Jason Narducy. 09 Mar 2019 Put up a setlist page for the 08 Mar 2019 Bob Mould Band show at Gruenspan in Hamburg. Thanks to Jason Narducy. Thanks to Dave Leibowitz for the Omaha photo. 06 Mar 2019 Put up a performance stills page for the 18 Dec 1983 Hüsker Dü show at The Channel, Boston MA. The photo turned up on social media recently with no background info, and it appears be to some sort of double exposure or deliberate overlay. Photographer has not been identified. The venue was determined by recognition of The Channel (note the sign in the background) by people familiar with it. Date was determined from Bob's clothing (he is wearing the same shirt he wore at Love Hall in Philly two days earlier. 05 Mar 2019 Put up a setlist page for the 02 Mar 2019 Bob Mould Band show at The Fillmore in San Francisco. Thanks to John Loughney. 05 Mar 2019 Put up a performance stills page for the 23 Feb 2019 Bob Mould Band show at Metro, Chicago. Thanks to Tim Brandt, Jim Duggan, and Les Ridingin. Thanks to Jaco Acuna, Rodger Ashworth, Daniel Davis, David Leibowitz, John Loughney, John Mulhouse, Denis Saulnier, Joe Schuman, and Mike Stuto. 03 Mar 2019 Put up an image of the official Fillmore poster for the 02 Mar 2019 Bob Mould show in San Francisco and updated the 2019 poster index page. Thanks to John Loughney. 03 Mar 2019 Put up a setlist page for the 01 Mar 2019 Bob Mould Band show at the the Teragram Ballroom in Los Angeles. Thanks to Jason Narducy. 01 Mar 2019 Added Bob Mould's 28 Mar 2019 solo instore performance/signing at Electric Fetus in Minneapolis to the dates page. This is a private promotional event for which passes were available to the first 250 customers who pre-ordered Sunshine Rock; it is now sold out. Thanks to Bob Mould for the info. Updated the 1983 and 2019 poster index pages. Thanks to Lee Ellingson, Chris Pretti, and Prison Art. 27 Feb 2019 Put up a performance stills page for the 23 Feb 2019 Porcupine show at Elks Lodge, Red Wing MN (Big Turn Music Festival). Thanks to Tobi Severson Norton. 26 Feb 2019 Put up a setlist page for the 23 Feb 2019 Bob Mould Band show at Washington's in Fort Collins CO. Thanks to Jason Narducy. 25 Feb 2019 Put up a poster image for the Mar 2019 Porcupine tour (opening for The Flesh Eaters), added a missing tour date (10 Mar 2019, Lincoln Hall, Chicago), and updated the 2019 poster index page. Thanks to Brian Schumacher for the shot of Mr. Smalls with Bob's name on the marquee. 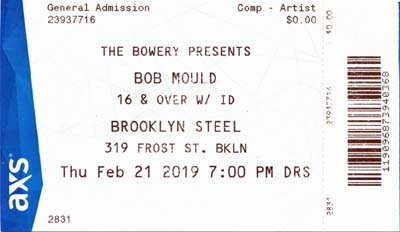 25 Feb 2019 Put up a performance stills page for the 21 Feb 2019 Bob Mould Band show at Brooklyn Steel, Brooklyn NY. 24 Feb 2019 Put up a setlist page for the 23 Feb 2019 Bob Mould Band show at the Metro in Chicago (second of two nights). Thanks to Jason Narducy. Thanks to Chris Bingham, Marshall Grange, Brian Schumacher, and Aaron Sumner. Thanks to Jason Narducy and Aaron Sumner. 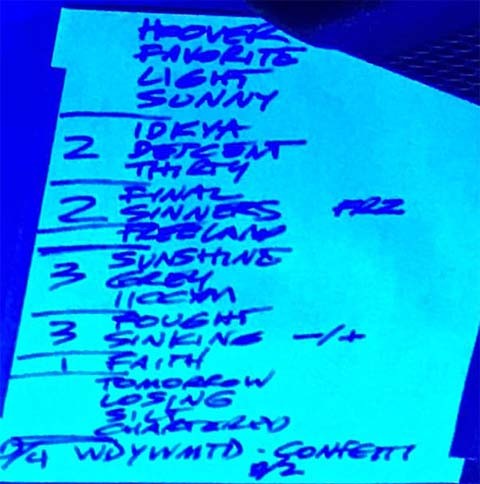 19 Feb 2019 Added a handwritten setlist image to the setlist page for the 16 Feb 2019 Bob Mould Band show at the Paradise in Boston. Thanks to Ken Cring. 19 Feb 2019 Put up a performance stills page for the 16 Feb 2019 Bob Mould Band show at the Paradise in Boston. at the Paradise in Boston. 16 Feb 2019 Put up a performance stills page for the 15 Feb 2019 Porcupine show at Schubas in Chicago. Thanks to Geoff Greenberg. 16 Feb 2019 Put up a performance stills page for the 15 Feb 2019 Bob Mould Band show at Union Transfer in Philadelphia. Thanks to André Archimbaud and Kermit Burroughs. 16 Feb 2019 Put up a performance stills page for the 14 Feb 2019 Bob Mould Band show at the 9:30 Club in DC. Thanks to Steve Avery and Joe Novotny. 16 Feb 2019 Put up a setlist page for last night's Bob Mould Band show at Union Transfer in Philadelphia. Thanks to Jason Narducy. 15 Feb 2019 Put up a setlist page for last night's Bob Mould Band show at the 9:30 Club in DC. Thanks to Steve Avery and Jason Narducy. 15 Feb 2019 Put up a performance stills page for the 03 Apr 2011 Grant Hart show at Café de la Danse in Paris, using screencaps from this YouTube video. Thanks to Kevin Whitehead for the pointer. 13 Feb 2019 New Porcupine date announced: 30 Apr 2019, Palace Theatre, St Paul MN, opening for the Bob Mould Band. Note that this date marks the 40th anniversary of the very first Hüsker Dü show, and Bob has been hinting at something special. More info here. Updated the 2019 poster index page. 12 Feb 2019 Put up a performance stills page for the 12 May 1985 Hüsker Dü show at the 9:30 Club in Washngton DC. Thanks to the photographer, Jim Saah. 12 Feb 2019 Another Bob Mould Band Sunshine Rock tour date was recently added: 28 Feb 2019, The Casbah, San Diego (already sold out). Put up a venue image page for The Casbah, replacing a dead link. 29 Jan 2019 Put up a performance stills page for the 22 Jan 2019 Bob Mould solo show at Moody Theater, Austin TX (Hi, How Are You Day). Created from screencaps of streaming concert video. 28 Jan 2019 New Porcupine date announced: 05 Apr 2019, The Aquarium, Fargo ND. More info here. 26 Jan 2019 Put up a print ad image for the 04 Jun 1987 Hüsker Dü show at Barowiak, Uppsala, Sweden, 04 Jun 1987. Thanks to Jan Sundström. 26 Jan 2019 Put up a performance stills page for the 16 Dec 1983 Hüsker Dü show at Love Hall in Philadelphia. Thanks to Robert Arce. 24 Jan 2019 Put up a setlist page and a second poster image for the 22 Jan 2019 Bob Mould solo gig at Moody Theater, Austin TX (solo electric set for ACL Hi, How Are You Day 2019, and updated the 2019 poster index page. 22 Jan 2019 New Porcupine date announced: 09 Mar 2019, Turf Club, St Paul (opening for The FleshEaters). More info here. 20 Jan 2019 Corrected the venue for the 25 Jun 1984 Hüsker Dü gig: Hard Times was located in Richmond  not Alexandria VA as had been surmised. Rewrote the venue description page and added a venue image page (the club is long gone, but the building survives as a Thai restaurant). Thanks to Chip Jones and Kermit Burroughs. 19 Jan 2019 Put up a performance stills page for the 12 Jan 2019 Porcupine show (with guest Henry Cluney) at Ed's No-Name Bar in Winona MN. Thanks to Kelly Bystrom, Jacob Grippen, and Jon Swanson. 19 Jan 2019 Put up a flyer image for the 09 Mar 2019 Bob Mould Band show at the Columbia Theater in Berlin and updated the 2019 poster index page. Thanks to Steffen Burghardt. Also put up a flyer image for the Grand Rapids gig and updated the 2019 poster index page. 08 Jan 2019 Put up a performance stills page for the 01 Dec 1992 Sugar show at Batschkapp, Frankfurt, Germany. Thanks to Stefan Kullik. 06 Jan 2019 Put up a setlist page for the 01 Dec 1992 Sugar show at Batschkapp, Frankfurt, Germany. Thanks to Stefan Kullik. 04 Jan 2019 New Bob Mould date announced: 22 Jan 2019, Moody Theater, Austin TX (solo electric set for ACL Hi, How Are You Day 2019 benefit show). Added a poster image and updated the 2019 poster index page. Thanks to Stefan Kullik for confirming the Frankfurt date and identifying the venue.